Geographical location offering a proximity to both the Arcachon Basin and the Atlantic Ocean beaches. Located to the north of the Arcachon Basin, in the tourist seaside resort of Lège Cap Ferret, the 4 star Les Embruns is an open-air holiday resort, popular with numerous holidaymakers in the Gironde. Bathed in sunshine, nestled in a forest and barely 500 metres from the beach, the Les Embruns campsite has a multitude of benefits to appeal to holidaymakers. 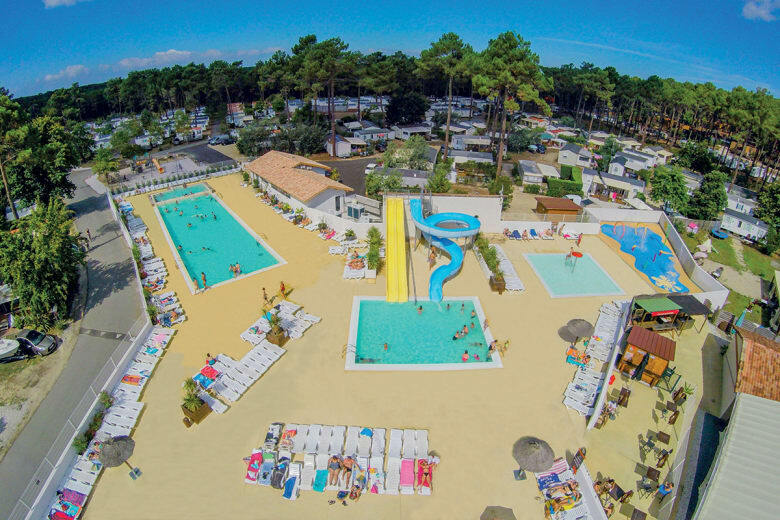 At the heart of a 20-hectare pine forest, the Les Embruns campsite enjoys one of the most idyllic geographical locations, notably having proximity to both the beaches of the Arcachon Basin and that of the Atlantic coast. The 3 nearest beaches, which belong to the village of Claouey – Le Four, one of the ten villages forming the town of Lège Cap Ferret, are all located less than 700 metres from the campsite. The names of these beaches are Plage de la Croix des Marins, Plage Bertic and Plage des Pastourelles. The ocean beaches, are barely 5 kilometres from the Les Embruns campsite. Popular with surfers, these beaches are also perfect for children who can build sand castles whilst their parents indulge in idleness under the Côte d’Argent sunshine. Surrounded by the forest, the campsite is no further from the town and its shops. The closest hypermarket is accessible on foot, as are the bars and restaurants of this famous seaside resort of the Arcachon Basin. 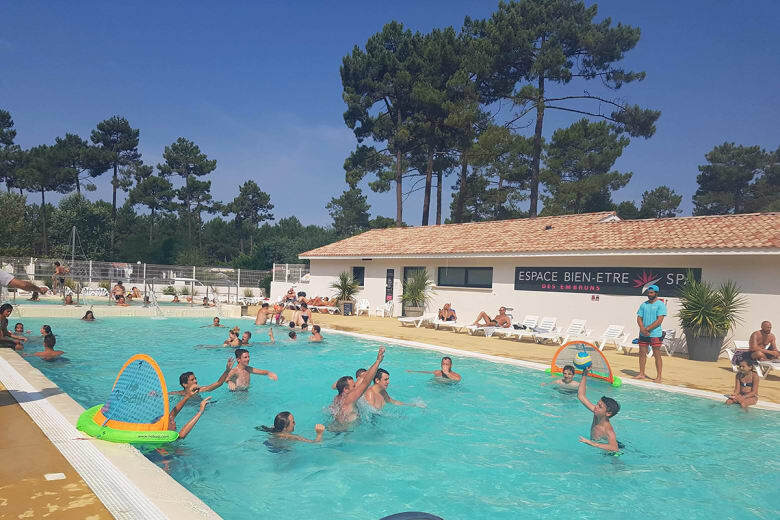 On-site, this family campsite in Lège Cap Ferret has a multitude of services, such as a bar - snack-bar - restaurant open everyday in June, July and August and during the weekends in the low season. There is also a launderette, as well as a bicycle hire service, and the campsite is fully equipped with Wi-Fi, enabling everyone to access the Internet network (a charged for service) wherever their pitch is located. The pitches, quite rightly are vast and, for the majority, are shaded at the Les Embruns campsite. All of the latter are occupied by holiday rentals. As they choose, holidaymakers have the possibility to stay in mobile homes, chalets as well as the Natur’house accommodation. At the heart of the campsite, the impressive aquatic park never fails to light up the eyes of those who love aquatic pleasures! 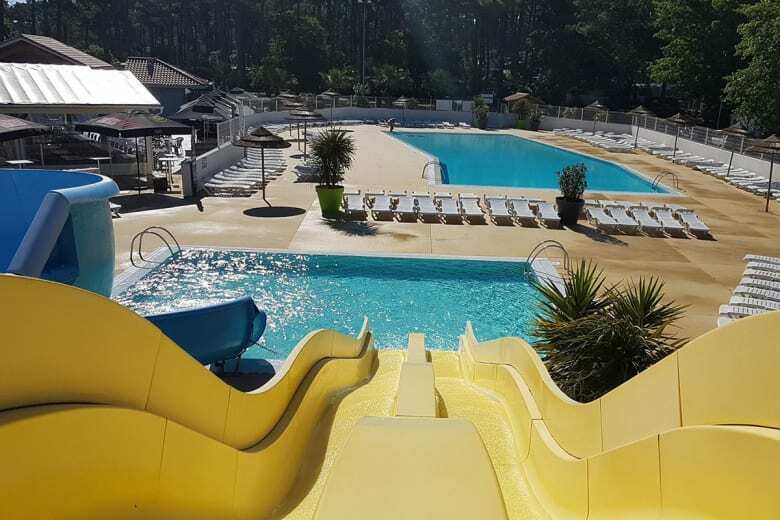 Over a surface area exceeding 2,600 m², the swimming area at Les Embruns is made up of two large swimming pools, a Jacuzzi for relaxation, a paddling pool, as well as a splash pad for children and 3 large slides for thrill-seekers! 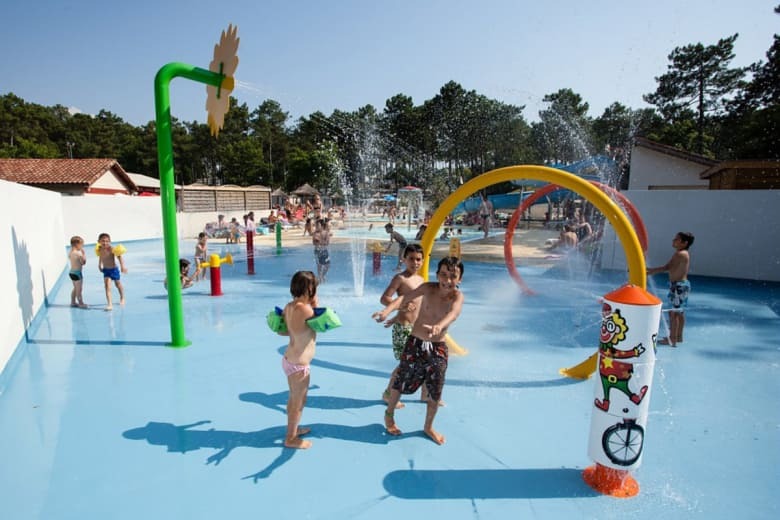 To unwind after swimming, nothing beats a visit to the well being area of this 4 star campsite in the Arcachon Basin. There is a steam room, a sauna, 2 treatment and massage cubicles, as well as a relaxation area. Included amongst the other leisure facilities within this establishment are a pétanque terrain, a multi-sports ground, ping-pong tables, a children’s play area, a rope pyramid, a mini-golf course and other activities. This enables all holidaymakers to take part in various sports and leisure activities. Although residents at Les Embruns have the possibility of having fun throughout the period that the campsite is open during the year, thanks to these facilities, in addition the high season offers them the opportunity to make the most of a multitude of activities and entertainment arranged by the campsite team. From fitness lessons to aquaerobics sessions, sports tournaments to dance evenings, karaoke evenings and shows, children and adults are spoilt for choice as to how to fill their summer days. You should also note that, in July and August, a children’s club opens to those aged 4 to 12 and a teenagers’ club for those aged 13 to 18. On the menu are creative workshops, dance lessons, games, days out to discover the flora and fauna of the Arcachon Basin, and other activities. From Monday to Friday, the very young thus also have the opportunity to meet up, have fun and create friendship ties!